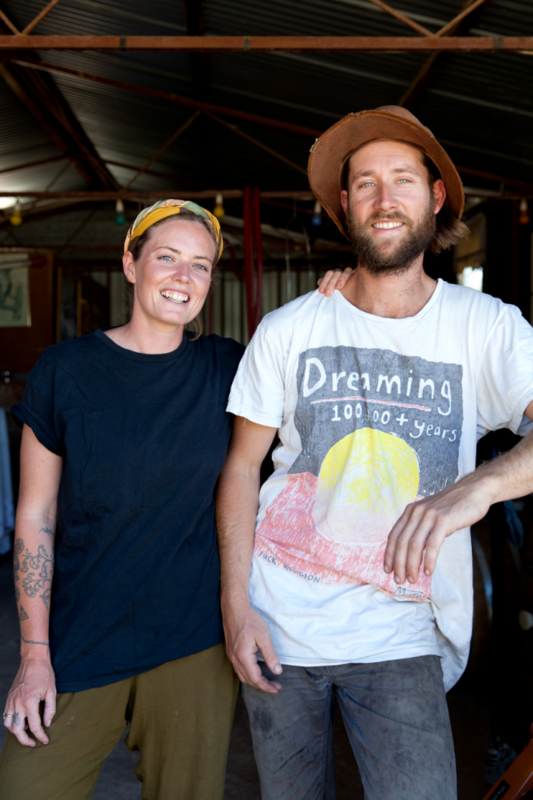 We are very pleased to announce that we are now working with a couple who we consider to be making the most exciting wines in Australia, Tim Webber and Monique Milton of Manon. Tim and Monique moved to Manon Farm in 2016. It occupies a beautiful part of the Forest Range on a ridge some 600 metres above sea level, with views all the way down to the Indian Ocean at the Gulf of Saint Vincent. The elevation and cool breezes from the gulf make for a long, slow ripening period, a real blessing in this country. The soils are a complex mix of red clay, quartz and schist, which gives the wines their compact nature, along with a distinctive mineral character. Monique comes from a pioneering family of farmers back in her native New Zealand, whose vineyards were the first in the country to be recognised as organic and biodynamic. Tim is a gifted chef who has cooked at some of Australia’s most interesting restaurants and was responsible for opening Sydney’s first natural wine bar and that is where he met Alex and Damiano, almost a decade ago. Tim and Monique are thoughtful, earnest people who are deeply passionate about the land and for them, like many of our producers, this extends well beyond just wine. Only six of the farm’s ten hectares are planted with vineyards, the rest is left to orchards, vegetable gardens, livestock, native forest and plenty of kangaroos. They farm biodynamically, without irrigation and with a real focus on diversity that allows nature to find its balance. It goes without saying that they do not use chemicals and instead focus on infusions of seaweed, herbs and minerals to let the plants thrive. The work in the cellar, an old tractor shed, is driven by patience, judgement and a maturity beyond their years. Winemaking is both fluent and dynamic, allowing the two to make wines based upon what nature offers them that season and as a result, they will release a different collection each and every year. They never add anything to the wines and most importantly, do not release them until they are ready. This patience allows these pure, vibrant wines to garner layers of character and poise. Tim and Monique are amongst the most talented young growers we have come across and it is a real pleasure to be bringing their wines to London. If you work in the trade, we will be pouring the wines for the first time at our Tasting of New Wines on Monday 11th February at Leila’s Cafe in Shoreditch. If you’d like to drop by anytime, please RSVP by replying to this email. We have just received the following wines. The fruit here comes from an extremely steep east-facing parcel behind the tractor shed. A blend born in the vines, where Chardonnay and Sauvignon Blanc are harvested together. The grapes are crushed by foot before being slowly pressed with juice then transferred into old oak barrels to ferment. This is extremely open and inviting, striking a perfect balance between its fruit, texture and mineral core. A blend of Chardonnay and Savagnin from the first grapes Tim and Monique harvested in 2017. The trees and plants surrounding this part of the parcel prevent the vines from receiving too much sunlight. Crushed by foot and basket pressed, the wine ferments in old wood. Reflecting this cooler vintage, this is taut, lean and savoury, with delicate flavours of citrus and stones. A maceration of all the white varieties grown on the farm, those being Pinot Gris, Sauvignon Blanc, Savagnin & Chardonnay. A true field blend, the grapes are gradually added to a large fermenter, were they are left on skins, some hand destemmed and some in whole bunches, for ten days. The grapes are then basket pressed and transferred into old oak barrels to age. As the name suggests, this has the most wonderfully inviting colour and aroma and a gentle palate of stone fruits and spice. Made from a direct press of Pinot Noir to which stalks and whole bunches are added to add colour and crunch. The wine ferments in stainless steel and is then transferred into old barrels for elevage. This is a little reduced on opening, but with air quickly blossoms into a wonderfully inviting rosato, with lots of little red fruits and forest floor packed into its nimble frame.